Sometimes a sire goes quiet through no fault of his own – but quite often – it’s the calm before the storm. The successful return to racing of ‘comeback kid’ Mic Mac in the Listed ATC Civic Stakes at Rosehill at the start of July highlighted his sire Statue of Liberty (USA), who is of course best known for giving us hulking sprinter Hay List. While Hay List is his undisputed headline horse, it was Mic Mac that first put Statue of Liberty on the map winning the Group II ATC Hobartville Stakes as an autumn three year-old in 2009. He’s won eight races in total, close to a million dollars in prizemoney and breeders that have utilized his sire since he returned to Victoria following an absence of two years in 2007 and 2008 will be hoping there are more like Mic Mac and Hay List in the pipeline. 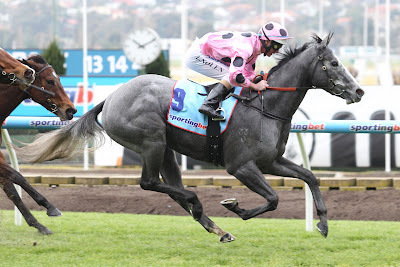 Now with Eliza Park International, after starting his stud career at Blue Gum Farm, Statue of Liberty is a horse that has always held plenty of appeal for breeders. A son of breed shaping sire Storm Cat, Statue of Liberty won the Group III Coventry Stakes at Royal Ascot at two and was Group I placed as a three year-old running second in the Sussex Stakes over a mile at Goodwood. If you subscribe to the theory that a big female pedigree is what makes a leading stallion then none are bigger than that of Statue of Liberty. A half-brother to US Group I winner and leading sire Lemon Drop Kid, Statue of Liberty comes from the family of champion US sire AP Indy as well as successful sires including Summer Squall, Bite the Bullet (USA) and promising up and comer Duke of Marmalade (IRE), while this year’s Epsom Derby winner Ruler of the World also appears on the page. Since resuming shuttle duties to Victoria, Statue of Liberty has been afforded excellent opportunities by broodmare owners in the wake of triple Group I winner Hay List and his rise through the sprinting ranks. Statue of Liberty has a good crop of 122 rising three year-olds that should serve him well as they mature. So far this season, Statue of Liberty has had 27 2YO runners in Australia for eight winners, which is a promising indicator from a sire not particularly noted for his juveniles. The best of them is stakes-placed Octane Flyer, a winner of over $100,000, not to mention Miss Steele (below) and Miss Santa Fe, while it is worth noting that 22 of juvenile his runners have collected prizemoney this season. Three and four year-olds are the lifeblood of any stallion, it’s where the bulk of their winners come from and without them a sire can slip easily off the radar through no fault of his own. Statue of Liberty has covered 481 mares in the last four years at Eliza Park, so it’s now full steam ahead for him as each new crop comes online and gets their chance to prove their worth. Broodmare owners who use the crystal ball and need to consider what the state of play will be three years down the track when they hope to sell a yearling by Statue of Liberty after breeding to him this year, might find themselves looking at a very different scenario to what we see now. Statue of Liberty has had his fee reduced to $11,000 this year, which is the cheapest it has been since 2006, so if you like him this would be the year to go to him.